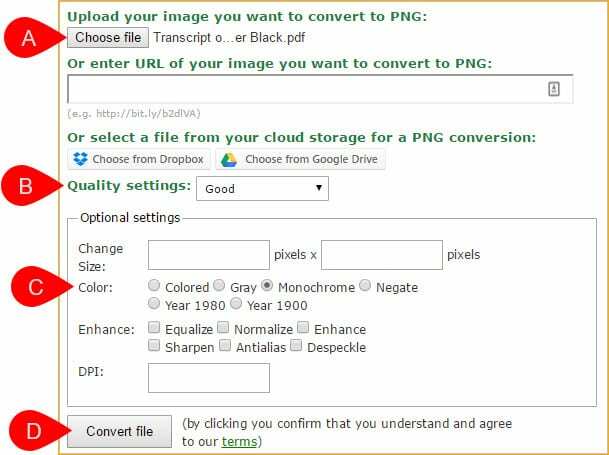 A frequently asked question on genealogy sites is “What’s the best format to use for images and documents?” to which the answer is usually PNG (or JPEG) for images and single page documents, but PDF for multipage documents. However, some people like to use PNG even for long documents because, while it takes a little more effort to set up, it does allow the document to be viewed through a web browser without having to download the file (which is what happens with PDF files). 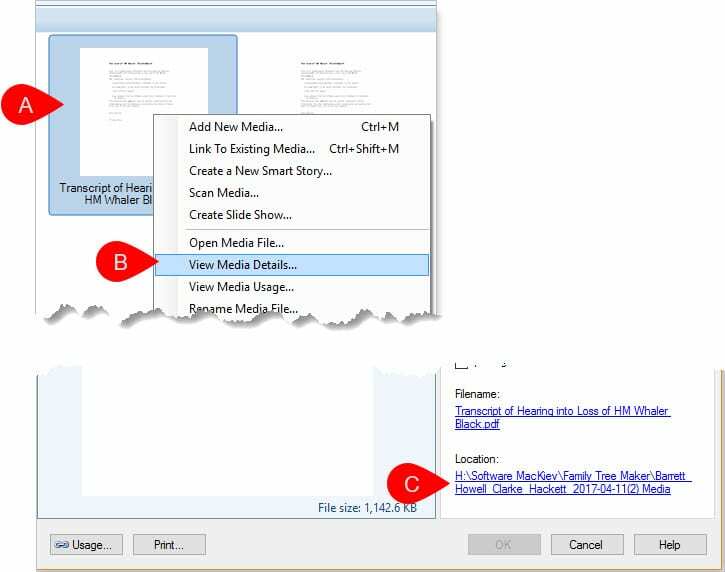 This post describes the step-by-step process of converting a PDF file to PNG. Don’t be put off by the apparent complexity of this process. It’s one of those processes that’s easier to do than the detailed instructions might lead you to believe. 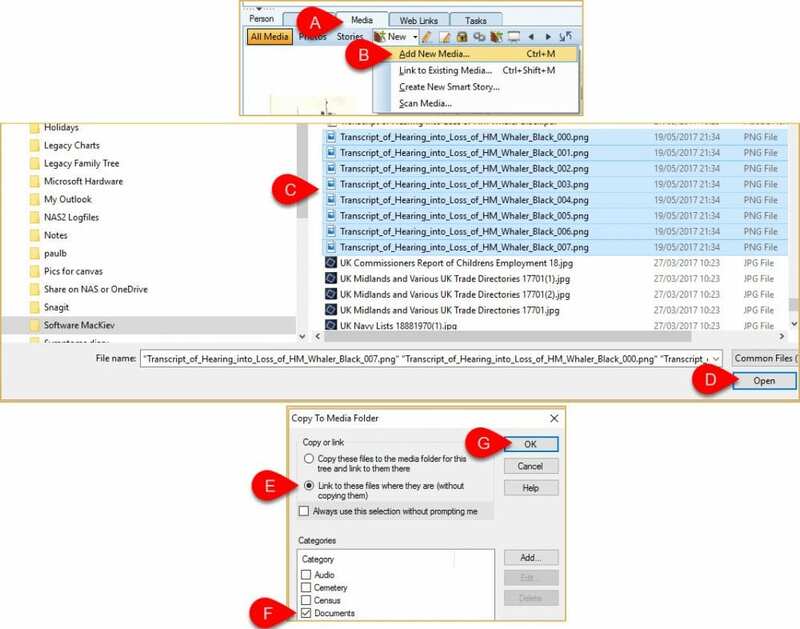 This process was written on the assumption that Family Tree Maker would be the source of the file to be converted, but the process is applicable to an PDF. This process uses the free online converter at Online-Convert. There are other online tools that do the same job, Choose the tool that you prefer. I will be using a target image format of PNG. I choose this over JPEG because it is the most web friendly file format with better compression and scalability. If you want to use JPEG that’s fine, but you’ll have to adjust the process to suit your preference. My setup is a Windows 10 Home 64 bit PC using the Chrome browser. Windows 7 / 8.x users should see no difference. Windows XP users may see no difference either but if you are an XP user you need to get off that platform pronto. It’s no longer supported by Microsoft and is vulnerable to hackers. Apologies to MAC users but I don’t use that OS so cannot tell you what the differences might be. However the process should be broadly the same. Screenshots from Family Tree Maker (FTM) are from version 2014.1 using the Windows theme. I don’t anticipate they will look much different in FTM 2017 when it is released but I will update this post if necessary. Go to Online-Convert. On the Home Page, go to the Image Converter section (A), select PNG from the drop down (B) and press Go (C). A Note to FTM users. This process converts a file but leaves the original intact. 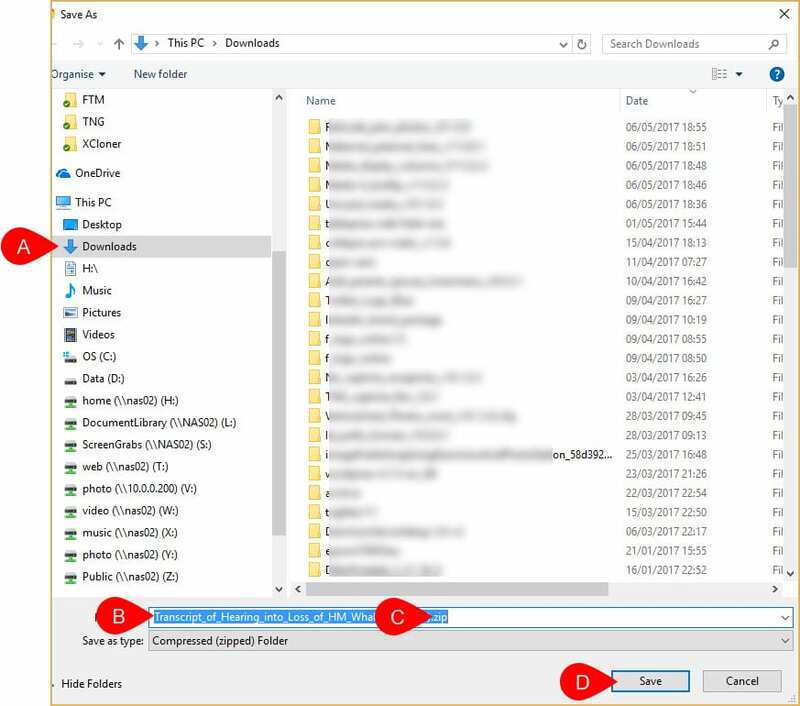 This means you can perform the conversion on a file in your FTM media library OR on a copy in your Windows Document Library without any fear of the original being deleted or changed. Whichever source you choose, you will have to manually link the converted PNG files to the appropriate person record in FTM. That step is included in these instructions. For the purposes of this demonstration I will assume you want to use your FTM library media as the source of the file to be converted AND that the converted items will be put there too. On the Online-Converter screen enter the file path and filename that you just obtained. (A) It’s easiest to do this by clicking the Choose File button and navigating to the location, finding the file and double clicking it (A). This avoids any typing errors. Next choose your preferred quality setting. (B) For the purposes of this demonstration I have chosen the middle-of-the-road setting Good. The higher the quality you choose the bigger the file. If you will need to zoom the document to see greater detail (for example because it’s an historic handwritten census form that’s hard to decipher) then you might need to choose a higher setting). Edit: Actually, if your original document is monochrome and text only, a higher setting might be better, as such files use very little file space. This is the exception to the rule though. Then choose your Colour preferences (C). In this case I know the source is Monochrome. Online-Converter will display a conversion progress status. On completion, a Windows Explorer window will open. It will probably default to your Windows Downloads folder (A). If it doesn’t, you should navigate to the Downloads folder. If you want to use a different folder for this temporary file you can. A file name will be suggested, based on the original file name. (B) and you will see that it is a zip file (C). For the uninitiated, a zip file is a special file that is used to bundle up a number of related files into a single package that can easily be transported from one computer to another. It is a purely temporary file – we will be extracting the content in a later step. And we will delete it when we’re done. 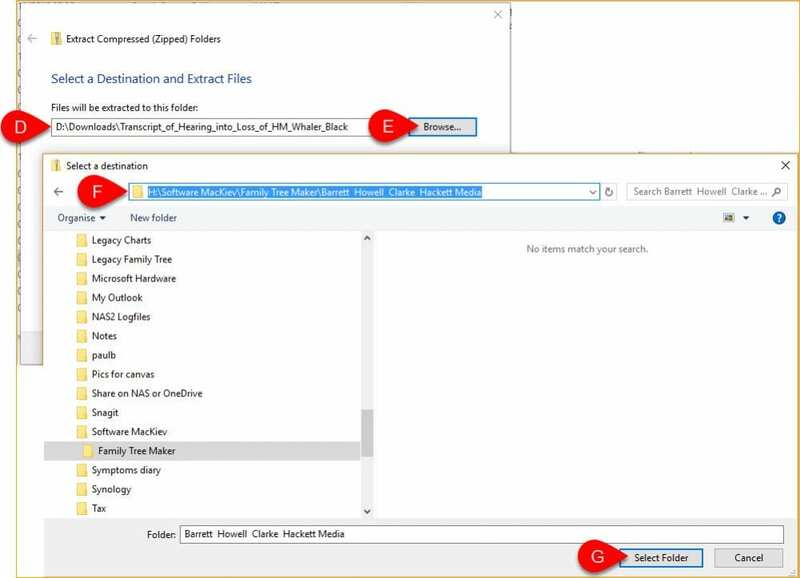 A new window will open asking you to select a folder in which to place the extracted files (D). We want to place the files in the FTM Media Library so please do NOT select the default folder. Instead press Browse (E). Each page of the original PDF has been separated into a sequentially numbered PNG file with the first page numbered “000.” Why not “001?” I don’t know. You can’t influence it, and it’s easier to just accept it. You also need to decide what to do about the original PDF file. If you leave it in place then you will have duplicated content in FTM (and Ancestry.com when syncing.) On the other hand, some of your users on Ancestry.com may prefer to use the PDF file. There’s no right or wrong answer to this – again, it’s your choice.